Micky Moore, left, with manager Adam Murray. 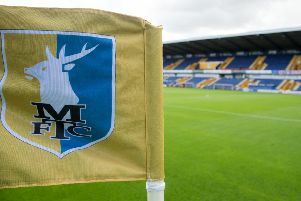 Mansfield Town first team coach Micky Moore said Stags can stay up if they can capitalise on their decent home form as they prepare for two crunch games in four days at One Call Stadium. Northampton visit on Saturday with Luton in town on Tuesday, and Moore believes another 21 points from the last 17 games could be enough to stay in the League. He said: “It is a big four days for us with Northampton and Luton at home. Our home form is going to be paramount now we are in the last 17 games. “Our home form has not been too bad in all honesty. We just need to look after our own. We have six games in February, four at home, we have looked at them and we have a minimum points requirement. We are doing that for each month. He added: “Everyone seems to be beating everybody. On Tuesday York drew at Luton, having been 2-0 up and a man sent off. “Northampton are in form and have won five of their last six, though they lost to Hartlepool on Tuesday. That was down to an individual error when their centre half tried to get the ball back to his keeper and it was intercepted. After a fine 1-0 home win over Stevenage last weekend, Stags flopped 2-1 at Morecambe on Tuesday night and Moore said: “There was a lot of frustration in the changing room on Tuesday night. Between the two 18-yard boxes we didn’t feel we had played that bad. “We have got to stay on the process we are on. We believe we are largely playing well, but need to tweak things. We need to turn performances into results. “After the good result on Saturday we went into Tuesday’s game with a lot of confidence. “At 2-1 down, the second half was the story of our season as the lads created a lot of chances but just couldn’t finish them. We are not clinical enough. The fact we’ve only scored 24 goals all season tells its own story. Moore said he had been impressed with how new boss Adam Murray was handling the situation, saying: “It’s all new to him, but I think he’s coping really well. “In his 11 League games in charge we have been in front six times but only won three of them. We have not got over the line in the other three – it’s fine margins. “We have had some horrific injuries over the season to key players. If bought in advance, tickets for Saturday’s Northampton game are just £7 per person with U7s admitted free of charge. You can book tickets by visiting the ticket office, situated adjacent to the Quarry Lane, between 10am to 5pm (Monday to Friday), by calling 01623 482482, or by visiting www.stagstickets.co.uk. To take advantage of this special £7 offer, you MUST buy tickets before 5pm on Friday. Normal matchday ticket prices will be in operation on the day of the game.